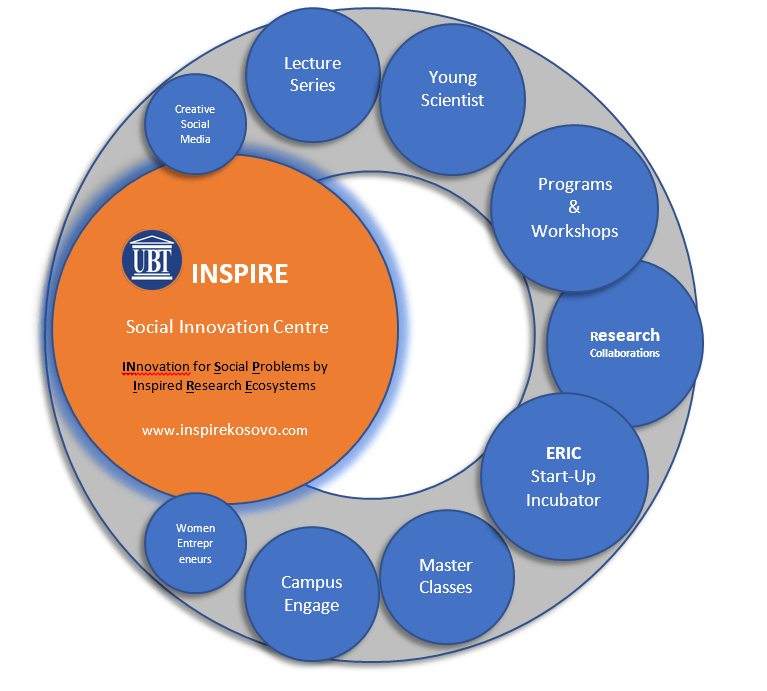 INSPIRE is the Social Innovation Centre at UBT. It is a fully integrated knowledge Centre of the UBT Kosovo RIED Institute. INSPIRE stands for INnovations for Social Problems Inspired by Research Ecosystems. The INSPIRE Social Innovation Centre, Kosovo is inviting interested staff/students to put forward designs for its logo and public website. Bids should be submitted to Bejtush Ademi via email ([email protected]) by 12noon on Friday, 11th November 2017. The winner will be chosen within a week of the presentations. The winning project will commence building the website on 21st November. Our target launch date is 18th December 2017. INSPIRE was founded in October 2017 as a Centre for Social Innovation and Entrepreneurship that aims to address unmet social needs with innovations developed through inspired research activities. INPIRE aims to create shared value for communities by merging academic knowledge and know-how with unparalleled capacities in skills based training, to enhance the problem-solving process by fostering inspired innovations through academic research and industry/ civil society participation. As a facility, it utilizes leading approaches to children, youth and adolescent development whilst providing education in creative thinking, social innovation, and entrepreneurship. for undergraduate and postgraduate students of the University for Business and Technology and other academic institutions in Kosovo and surrounding Balkan states. The INSPIRE Social Innovation Model fuses into a single offering, two existing approaches to social innovation – a skill-based practice and a research based educational approach provided through academic curriculum. The Centre promotes a transdisciplinary and multicultural educational approach with global experiential learning opportunities. It is uniquely the first and currently only Social Innovation Centre with this emphasis in western Balkans. Our main message is that INnovations for Social Problems also requires Inspired Research Ecosystems, hence I-N-S-P-I-R-E.
Our offering is targeted initially at Students/Adolescent. The various programs have to be clearly understood, without ambiguity. Program must be clearly identifiable and appealing to students. The interaction with the website must be engaging from start to finish/ creative, innovative and ingenious to appeal also to an international student demography. Youth engagers with our website must be kept interested and drawn to interact with the website in innovative interactive ways. Program offerings for this demographic must be clearly and youthfully communicated. It should provide a feeling of security and appeal to their needs. They should feel encouraged to participate. Businesses are welcome to contribute to funding, ideas generation, innovation processes, be involved in research collaborations and assist in the diffusion of innovations. We would like to develop strong relationships with corporate entities by using the website to support for example, co-branded sponsorships. Once a year we run a volunteer program in conjunction with civil society organisations. The website should showcase our partners and act as a recruitment drive for these volunteers, as well as other non-student and non UBT student volunteers. Secondly, the Campus Engage initiative should have a presence all year round and be linked to activities of similar nature in Europe and globally. The Civic Engagement Office is generally responsible for such activities. General information of government ministries, departments and agencies and all relevant bodies in Kosovo and internationally, relevant for social innovators and enterprises must be showcased. Hence a professional web presence should assist in creating awareness and providing relevant information. The INSPIRE Centre will continually be expanding its partnership network to diverse bodies; government, organisations and lateral NGOs. The website should act as a vehicle to strengthen the intended partnership network. The strength of our efforts relies on the quality of our people. We would like the website to attract job applications from qualified individuals in the fields of Creative Thinking, Design Thinking, Human centred design, Innovation and all aspects of Entrepreneurship. The website should advertise the uniqueness of our offering. competition platform would be ideal. Website should visually represent a state of the art a purposely built, fully serviced building providing …… sq. m of office, industrial and commercial space dedicated to the growth of young knowledge-based social enterprises. The website should innovatively represent its goal; the goal is to accelerate the development of start-up companies through a comprehensive combination of infrastructure, business support services and specialised resources before and during their foundation. A ‘Meet the Resident Entrepreneurs’ section would be good. INSPIRE Women – Women Entrepreneurs Initiative. The INSPIRE Women initiative is designed to equip local women business owners with the tools needed to support their business aspirations, while minimizing some of the challenges and roadblocks unique to them as women. It’s about creating a safe, collaborative and supportive work space. download our press kits/ blog etc. INSPIRE would like the general user to engage in the following activities on our website. Read but not download research material, repository of workshop materials, master classes, webinars and other forms of generated knowledge materials. dominant hue together with neutral colors like beige and grey. We would like to feature a mixture of object and people-based photography. The home page design should tie in with our main message, which is: Innovation for Social Problems by Inspired Research Ecosystems. Where people photography is concerned, a mixture of races and ages should be represented.